Pay scale ( वेतन ) : IDA Pay Scale of Rs.29100-54500/- (IDA). Educational requirements ( शैक्षिक आवश्यकता ) : Post-Graduation in Hindi from a recognized University with English as a subject at Graduation level and should have Diploma / Certificate from a recognized Institute in translation from Hindi to English and English to Hindi. OR Post-Graduation in any Subject from a recognized University in which Hindi and English will be main subject at graduation level and should have Diploma / Certificate from a recognized Institute in translation from Hindi to English and English to Hindi. Job responsibilities / description ( उत्तरदायित्व) :Management of Hindi Section and implementation of Government Orders related to day to day work. The Official has to plan for training as well as look after the work related to Parliamentary Committee for Constitutional provision. 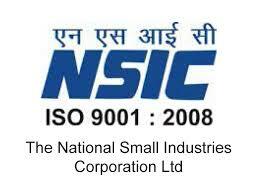 How to apply National Small Industries Corporation Limited (NSIC) Vacancy ( आवेदन कैसे करे ) : 1. The candidate needs to apply ONLY ONLINE through CAREER section of www.nsic.co.in .